Perforated tape was a very long time the most popular input medium. Any numerical control system functions with the aid of an established number language. The number language has been standardized through the efforts of the Electronic Industries Association (EIA) and others. The standardized number language has enabled man to "communicate" with machines. Man is able to tell a given machine "what to do" and "when to do it". Mans communication with a given machine is placed on a tape in a way that the machine's interpreter can read and remember the "message". Ultimately, the control unit at the side of the machine gives the commands to perform as instructed in the "message" punched on the tape. Basically, numerical control directs some or all of a machine's performances from coded instructions based on a number language. Standarization of the number language has played a significant role in the design and manufacture of industrial products for some time. Most of the standards, or rules for using the language, which may be taken for granted today, required considerable study and negotiation by interested manufacturers. With the development of numerical control and its increasing use for machine tools, builders of control systems and machine tools and users of numerical control equipment realized the importance of standardizing items which are common to many numerically controlled systems. Coded numerical instructions for a machine are prepared in advance and placed on a type of N/C input program media. The coded instructions may be recorded on a deck of cards, a magnetic tape, or a tape which may be made of paper, plastic, metallic foils, or any combination of these materials. Examples of these input media are shown in the image on the right. Instructions recorded on any of these media are used to control the sequence and performance of many machine tool operations. In 1970 the perforated tape has been established as the most common N/C input medium. The perforated tape has become so universally accepted and adopted that numerical control is quite synonymous with tape control. The tape may be made of a variety of materials. It is one-inch wide and has eight channels running the length of the tape. Holes are punched in these channels in accordance with an established perforation design for each given symbol or numeral used in N/C. The Electronic Industries Association (EIA) developed and standardized many facets of numerical control systems. One of the major standards established by standard coding for this tape is based on the binary number concept. Below is a sample of a perforated tape used for N/C purposes. 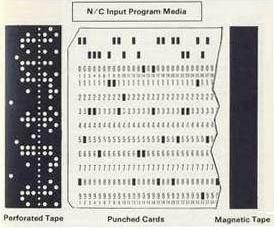 Punched cards, sometimes known as tabulating cards, were also used as a form of N/C input. Machine tool instructions are placed on the card with a card-punching machine. Another type of an established perforation format is used for each given symbol or numeral. The console, or MCU (Machine Control Unit), is equipped with a card reading device which "reads and interprets" input data and sends out signals to energize the machine controls. Magnetic tape for N/C purposes is very similar to the magnetic tape used for voice or musical recorders. The tape is coated with small particles of magnetized ferrous oxide. Sensing devices, within a magnetic tape reader translate the input signals and ultimately output signals are sent to the machine. Magnetic tape is seldom used in metalworking because of the presence of metal chips which will damage the tape and alter the signal inputs.